Religious leaders do not want to admit the real reason that people, young and old, are leaving their houses of God worship. As I’ve been told, the simple fact is the people are wising up and finally reading their bibles instead of the Catechisms of the Catholic Church and the many church pamphlets that teach contrary to the Righteousness taught in the Inspired Writings of the Apostles and Prophets. Notice the wild statements made by a Catholic priest who is endorsed by the present pope of Rome. homosexual love is a gift from (God) no less than heterosexual. The sodomite supporting priest, Paolis, described in his Facebook page how the meeting got organized: when requesting the meeting, he asked the Pope, “Is it possible?” Francis then responded, “Anything is possible. Talk to Cardinal Maradiaga and he shall prepare everything.” Paolis stated on his Facebook page, “And then (unbelievably) he kissed my hand! I hugged him and wept”. Paolis is “a well-known figure in Italy as a leading clerical apologist for the homosexualist ideology.” How, then, could the Pope not know about this man’s evil behavior? How could he kiss his hand and do mass with such a reprobate? [W]e must overcome the letter of Scripture. It is the same St. Paul in 2 Corinthians 3:6 who says, “The letter kills, but the Spirit gives life.” … That this biblical letter.. killed and continues to kill, unfortunately, at times, not only morally but also physically, is a fact. The Bible “is” not the word of God; the Bible “contains” the word of God. …Instead of wasting energy in endless controversy the Church aims to build a Christian spirituality of joyous acceptance of self, gratitude to God in the knowledge that homosexual love is a gift from Him no less than heterosexual. A spirituality in which we dialogue and we compare to all, but obey God alone. The only Inspired Books written by the Prophets of Yahweh are proven to be the Words of Yahweh, the Creator of mankind. These books offer mankind the perfect way of Life and peace; yet, they are rejected by the Catholic Church and their predecessors, the Catholic Coptics in Egypt. Yahweh, Who Inspired the Scriptures is not one of their Gods. The young and old alike are learning that the religions have not been teaching the Scriptures and yes, they see no reason to go there again. College students are saying the religions are teaching hatred and war instead of the Message of Love, Peace, and Health that the Savior, Yahshua Messiah, taught. The religious teachings are dividing the people, which is causing troubles in all schools across the world, they say. As a result, the whole world is involved in hatred and war. The problems facing mankind, which I believe are being seen by many students, are the lies concerning the Inspired Scriptures that were written by Yahweh’s Inspired Prophets. Most people call the book of Inspired Scriptures the Holy Bible, but it was originally called The Book of Yahweh. None of the religions fully teach the Scriptures as originally written; nor do they follow the Laws of Righteousness as did the Savior and His twelve Apostles. In fact, the Roman Empire fought against Yahweh and His Righteousness as is shown by the Prophet Daniyl. It’s also shown in their own history. For information concerning the identification of the fourth beast today, type ‘fourth beast’ into the ‘Yisrayl Hawkins Says’ program, and references to that subject will appear. It’s that simple. That program is a must for Bible scholars. Every question has an answer, which is easy and quick to find with the ‘Yisrayl Hawkins Says’ program. The answers are not interpretations; they are proven by other Scriptures. There has never been a program like this before. Those who do not yet have the ‘Yisrayl Hawkins Says’ program, call, write or email The House of Yahweh for information about how you can obtain it. Get the answer now concerning the fourth beast. This group made up of four religions and a lead spokesman, called pope now but called horn in the Hebrew Scriptures, were known as the Elders of Israyl in the days of Samuyl, the Prophet of Yahweh. They formed a great army that they used to murder all those who would not convert to their evil ways of war. Their teachings actually bring hatred and war. The people are seeing this firsthand today. Their roving army took cities and villages captive and led the citizens to Babylon and to Rome for training. Those who would not convert were killed. Others; men, women and children, were put to work building the Roman Empire. It was this roving army that stood on the part of the fourth beast and polluted the temple around 70 ACE. This was prophesied by Yahweh’s Prophet Daniyl around 607 to 534 BCE. Only The Book of Yahweh is proven to give accurate Prophecy. The Prophet Yeremyah showed they caused the world to forget the Name Yahweh for the lord. The word lord is not a divine title, as Unger’s Bible Dictionary shows. From where does the word lord spring? No mere man could know such would occur. But it did, just as Yahshua said it would. The Pharisees, Sadducees, Essenes and Herodians were required by Law to read The Book of Yahweh daily, as long as The House of Yahweh stood. Although they hated this daily reading, it was one of the Laws they were compelled to keep, since it was openly performed each day in front of all the people. But plans were made to destroy The House of Yahweh, which they called the temple, and moved The Book of Yahweh and all of the wealth of The House of Yahweh to Rome. That is exactly what they did. By 70 A.D., Jerusalem and Judea were left desolate, most of the people either killed or being held in captivity, or had become refugees fleeing to remote lands. All that remained in Israel was the defiant little garrison atop the mount at Masada, a fortress complex south of the Dead Sea, which was built by Herod the Great. Thus when the Temple was destroyed in A.D. 70 the period of the second exile began. (Diaspora) The Jewish people were soon to be scattered throughout the earth. For the next 1900 years the Jews would have no authority in the land [Yahweh] gave to Abraham, Isaac, and Jacob. General Titus almost completely destroyed Yerusalem along with The House of Yahweh that the Pharisees, Sadducees, Essenes and Herodians called the temple. They sought to kill Yahshua because He exposed the fact that they had rejected Yahweh and His Laws, even at that time when they were trying to control the people who wanted to keep Yahweh’s Laws. The Pharisees, Sadducees, Essenes and Herodians could not stop the people of Yerusalem and Israyl from keeping the Feasts and Sabbaths; so they moved their headquarters to Rome and sent their Roman army and destroyed the people, the city and the temple. Not only did they destroy Yerusalem, they also used their Roman army to hunt down House of Yahweh members, the followers of Yahshua and the twelve Disciples, and bring them before the High Priest for sentencing. By the time they destroyed The House of Yahweh in Yerusalem, the Pharisees, Sadducees, Essenes and Herodians had already built their luxurious headquarters on the seven hills of Rome. They had General Titus completely destroy the House of Yahweh buildings and move what was left of the wealth to Rome also. Notice again, the Pharisees, Sadducees, Essenes, and Herodians hated Yahshua, Yahweh, and the Laws of Yahweh. Why Hatred For The House of Yahweh? The One prophesied to live a sinless life and die for the sins of many was named in Scripture by the Inspired Prophets. He was named Yahshua, which means Yahweh will save His People from their sins. For complete details about His Name, type ‘Yahshua’ in the ‘Yisrayl Hawkins Says’ program and just hit ‘enter’, a search will be done for you. If you do not have the ‘Yisrayl Hawkins Says’ program, call, write or email us for complete information on the Names Yahweh and Yahshua. Before the Pharisees, Sadducees, Essenes and Herodians called their religions by these names, they were known as Korahites and the Elders of Israyl. And the sons of Korah were Assir, Elkanah, and Abiasaph. These are the clans of the Korahites. The event in Numbers 16 took place around 1790 BCE. Korah was the son of Izhar, the brother of Amram, the father of Mosheh and Aaron. Korah was cousin to these leaders of Israyl. The rebellious system that Korah followed was the same system that Cain followed. 13 Raging waves of the sea, foaming up their own shame; wandering stars to whom is reserved the blackness of darkness forever. 15 To execute judgment on all, to convict all those who are unholy among them for all their unholy deeds, which they have committed in unholiness, and for all the harsh words unholy sinners have spoken against Him. 16 These are murmurers; grumblers, complainers; faultfinders, walking after their own lusts; and their mouths boast great swelling words of admiration, flattering other men’s pride for their own advantage. 18 For they said to you that there would be scoffers in the last time, who would walk according to their own unholy lusts. 19 These are the ones who separate themselves; leaving The House of Yahweh, sensual; bestial nature, natural, carnal, not having the Spirit. The same system of rebellion rose up against Yahweh’s Prophet Samuyl. Notice verse 7: serve Gods of Egypt. The ‘authorized’ King James Version falsely rendered the Hebrew word acher as other. As if Yahweh was just another God. Yahweh never identified Himself as a God. 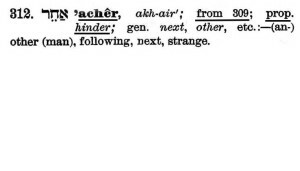 The Hebrew word acher used in I Samuyl 8:8 means properly hinder. This is according to the Hebrew dictionary in Strong’s Concordance. Did you notice in verse 5, evil like the Gods. The word Catholic means universal, meaning they worship all Gods. The same as in Egypt today, where their religion is named Catholic Coptic. This shows the Catholics of Rome and the Catholic Coptics are the same God worshippers. The Gods, then and now, bring forth evil. That’s why we have today what was seen in Cain and Korah. All the world has gone the way of Cain, Korah and the Nimrod system. To learn of the Nimrod system that is followed by the Roman Catholic Church and their forefathers as far back as Egypt, just type Nimrod into the ‘Yisrayl Hawkins Says’ program. This same system, calling themselves Pharisees, Sadducees, Essenes and Herodians, used the roving army, owned by the Herodians to pollute The House of Yahweh, called the Sanctuary of Strength by Yahweh’s Prophet Daniyl. People are leaving the house of worship because there is no Righteous strength in them. What is meant by Sanctuary of Strength? Notice, this is explained in The Book of Yahweh by Yahweh’s Prophet Malakyah. The Book of Yahweh? 1 For, behold, the day comes that will burn like an oven; and all the proud, yes, and ball who do wickedly, will be stubble—the day that comes will burn them up, says Yahweh our Father; and it will leave them neither root nor branch. 2 But for you who creverence My Name, the light of dRighteousness will arise with healing in its wings; and you will go out, leaping like calves released from the stall. 3 And the Word of Yahweh was given to be saying: the ewicked will be trodden down; for they will be ashes under the soles of your feet in the day that this will be done. 4 Remember the fLaw of Mosheh My Servant, which I commanded through him in Horeb for all Israyl, with the fStatutes and fJudgments. 6 And hit will turn the hearts of the ifathers to the jchildren, and the hearts of the jchildren to their fathers; before it comes to pass that the earth is struck with a curse. Pay close attention to the footnotes for Malakyah 4:1-6. Verse 1: b. wickedly; all Lawbreakers. He will execute Judgment among the nations, and through baptism He will separate the clean from the unclean of the multitudes of the nations of the whole earth. Verse 2: c. You reverence Yahweh by keeping His Laws. So that you may reverence Yahweh your Father by keeping all His Statutes and His Laws, which I command you, your son, and your son’s son all the days of your life; and so that your days may be prolonged. Verse 2: d. The opposite of sin. Verse 3: e. Sin. Yechetzqyah 18:20 is proof that wickedness is sin—the breaking of Yahweh’s Laws. Now these are the Laws, the Statutes, and the Judgments which Yahweh your Father has commanded me to teach you: so that you may observe them in the land you are crossing over to possess. Verse 5: g. Hebrew nabiim. Word #5030, Hebrew Dictionary, Strong’s Exhaustive Concordance, shows this word means prophets. The army? Yes! The chief priest of the Pharisees, Sadducees, Essenes, and Herodians owned and ruled the roving army that they themselves built. The Pharisees, Sadducees, Essenes, and Herodians did not keep Yahweh’s Laws of Strength. They were required, by the same Laws given by Mosheh, to read and teach the Laws of Yahweh. This was the daily oblation given by the mouth of the Priest to those who came to hear the Laws at the feet of the Priest each and every day. 4 Through which exceedingly great and precious promises have been given to us by Him, in order that through these you may be partakers of that holy nature, and escape the corruption in the world, which is through lust. 16 But was rebuked for his iniquity; a dumb donkey speaking with a man’s voice restrained the madness of the prophet. This daily teaching of the Laws of Yahweh turned many people away from their iniquity. Iniquity is ignoring Yahweh’s Laws, changing Yahweh’s Laws or causing others to practice breaking Yahweh’s Laws; thereby, practicing sin. When the Righteousness of Yahweh, which is the Strength of Yahweh that turns the hearts and minds of mankind, is taught and practiced, it brings Peace. But the religions do not teach the Righteousness of Yahweh. Therefore, there is war and fighting all over the world at this time. They’re being seen now by young and old. They don’t like what they see coming from their religions, I am told. So, they are leaving the Roman Catholic Church that sits on seven hills. The religions are opposing Yahshua at this time, for He is High Priest over The House of Yahweh. LONDON (Thomson Reuters Foundation) – While wars in Syria, Iraq and Ukraine make headlines in the West, around 30 other conflicts receive little press coverage, and the resulting lack of pressure for change could have serious implications for millions of people, experts say. South Sudan ranked alongside Afghanistan and Syria last year as the three least peaceful countries in the world in an annual index compiled by the Institute for Economics and Peace. The civil war there is entering its second year, bringing the world’s newest country to the brink of bankruptcy and famine as violence has displaced at least 1.9 million of the nation’s 11 million people and killed more than 10,000. Fighting in the east of Democratic Republic of Congo displaced some 770,000 people in 2014, bringing the total number of displaced to about 2.7 million in a country of 68 million people. More than 20 armed groups are operating in just one province, North Kivu. Conflicts are also under way in Somalia, Yemen, Libya, Central African Republic and Pakistan. There are many relatively small, slow-burning conflicts in countries like India, Thailand, Russia, Turkey, Myanmar and Ethiopia but they should not be ignored, he said. Foreign policy often involves making difficult and debatable choices about which parts of the world matter more to a given country—and which, by extension, matter less. It’s about defining national interests and determining where those interests are most evident and endangered. This is why the United States has done far more to stop ISIS in Syria and Iraq than, say, sectarian war in the Central African Republic. The survey, this year’s edition of a study conducted annually by the Council on Foreign Relations’ Center for Preventive Action, flagged violence in Iraq between ISIS and the Iraqi military, and between Sunnis and Shiites more broadly, as the top priority for the U.S. in the coming year. Other high-priority potential scenarios include a major attack on the United States or a U.S. ally; a cyberattack on U.S. infrastructure; a crisis involving North Korea; the prospect of Israeli military strikes against Iran’s nuclear sites; a confrontation between China and its neighbors over territorial claims in the South China Sea; an escalation of the Syrian civil war; and growing instability in Afghanistan. Notably, they also include two contingencies that weren’t raised in last year’s report: an intensification of fighting between Ukrainian forces and Russian-backed militias in Ukraine, and heightened violence between Israelis and Palestinians. 1 And now, O priests, this special command; charge, is for you. 2 If you will not hear, if you will not take this to heart to give glory to My Name, says Yahweh our Father: You will deliver yourselves to a curse! Your blessings will be cursed; yes, they have been cursed already, because you do not take this to heart. 3 Behold, your seed will be corrupted, and dung, the excrement from your feast sacrifices, will be spread upon your faces; and you will be carried away, along with it. 4 And you will know that I have sent this special command; charge, to you, so that My Covenant might continue with Levi, says Yahweh our Father. 5 My Covenant with him was a Covenant of Life and Peace, and I gave them to him, so that he might give reverence to Me; and he reverenced Me, and stood in awe of My Name. 6 Truthful teaching of the Laws was in his mouth. Iniquity; perverseness, unrighteousness, was not found in his lips. He walked with Me in peace and equity; uprightness, and turned many away from iniquity; sin. Those Leaving Say No Peace or Eternal Life in Religions Today—Why? Notice verse 6. This curse is bad but it’s going to get much worse and then nuclear burning. Verse 5 shows why, because they are teaching the whole world to transgress Yahweh’s Laws of Righteousness and Peace. Due to this teaching, there is no love in the world today. The True Name of the Savior, Yahshua, you removed and replaced with the names of two Gods chosen by your pope, Constantine. Notice Yahshua’s Words to this generation. Like your fathers, the previous Nimrods, you still teach sin. You are nothing more than Satan worshippers according to your Bible. You are Failing because Your Evils are Made Manifest! People are now seeing where the religions are falling short. They are teaching hatred because they have done away with the Creator’s Righteousness. You are following the Nimrod (rebellious) system of deception and tyranny, as did Cush, Cain and Korah. You are prophesied to perish in the upcoming burning in this generation. You are all facing what was prophesied by the Great Apostle Shaul, whom you killed in Rome, along with many of the other Apostles. Notice his Inspired Words concerning the Nimrod system. Nimrod means rebellious. Therefore, this is a rebellious system you are prophesied to be caught up in. Also prophesied is a great falling away in the same generation as the coming of Yahshua, which is in progress at this time. Did you notice in verse 3 the ‘falling away’. The people are leaving you because they are learning of your sins, iniquity, and deceptions. Compare with what Yahshua said. That’s the reason why they are leaving; they are learning the Truth. In verse 7, notice the mystery of iniquity. From where is it coming? In II Thessalonians 2:3, we are told to ‘let no man deceive you’. The people are taking the Apostle at his Word. (CNN) At its core, Christian life is set of sacred traditions linking generations of sacraments and Sunday school lessons, youth ministry morals and family gatherings sanctified by prayer. An unbroken circle, in the words of an old hymn. In modern America, that circle may not be completely shot, but it is wobbly and badly bent, according to a new landmark study conducted by the Pew Research Center. The drops have been deepest among two of the country’s most formidable faith traditions: Catholics and mainline Protestants, so-called for their prominence in American history. They are actually being called out by Yahweh, the Creator, and Yahshua Messiah in this generation with the great gathering that is taking place now. Heed the warning. Harken the call.